The Great Hall space works well for sit-down dinners, cocktail parties, lectures, and more. Throughout the year, The Neighborhood House is utilized by individuals, as well as other groups and organizations for a wide variety of events, both public and private. First and foremost, The Neighborhood House is a non-profit community center serving the residents of Mt. Desert, but we are lucky to have a space that can be utilized by others as well. When using the space, please remember that The Neighborhood House is a very busy “house.” At times, multiple groups may be utilizing the space, and between 5am and 10pm, members will be occupying the lower level fitness room and studio space. For information on rental fees, policies, or other questions, please email or call us at (207) 276-5039. For the majority of events held in our space, the Great Hall (large room on first floor) is utilized. 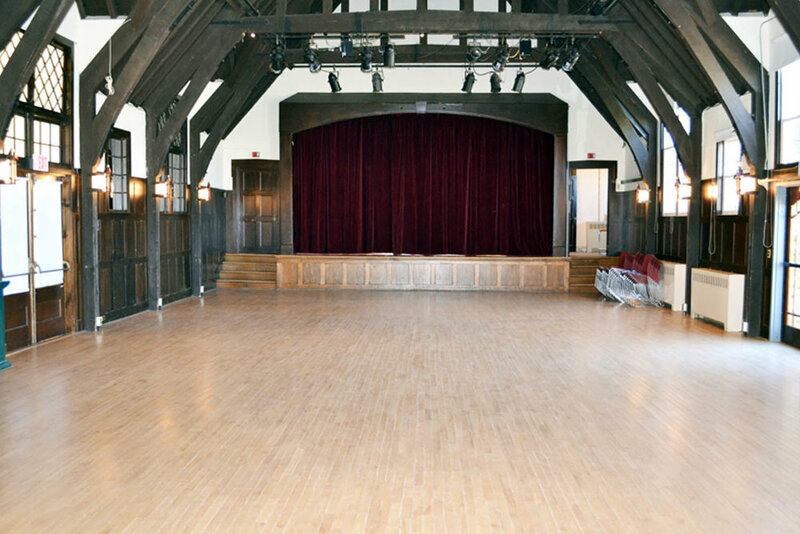 When renting the Great Hall, you also have use of the stage, kitchen, anteroom, and first floor restrooms. Tables and chairs are also available for use (see below for info). For groups or organizations that simply need a “meeting space,” some of our smaller rooms are also available. The large kitchen space works well for everything from pot-lucks to catered events. We have 12 round tables (5 ft in diameter; fit six comfortably), and 10 rectangular tables (8 ft long; fit 6-8 comfortably). We also have approximately 200 stacking chairs. Is A/V equipment available, such as microphones, projectors, etc? Audio/Visual equipment is not included with building rental. Under certain circumstances use of our large projector screen (w/out projector) is available. Does The Neighborhood House handle "Setup" and "Cleanup?" We do not offer setup or cleanup services. Renters are responsible for both, so please plan accordingly. We simply ask that you “leave the space as you found it.” We provide trash bags, cleaning supplies, mops, brooms, etc. (all located in the kitchen and pantry area). How Much Does it Cost to Rent the Space? Our rental fees vary depending on what sort of event is taking place, amongst other things. For example, we would require a higher rental fee for a commercial event such as an art show than we would for a child’s birthday party. Please email or call us at 276-5039 to discuss specifics. If you rent the space for a public event and will be serving alcoholic beverages, you will need a liquor license. If you will be allowing participants to bring their own beverages, a BYOB permit from the State of Maine is required. The Neighborhood House has copies of the application, but the renter is responsible for obtaining the permit prior to their event. Private events (i.e., not open to the public) do not require a permit. If beverages will be handled by a bartender or caterer, we suggest you make arrangements regarding permits, etc. with them in advance of your event. 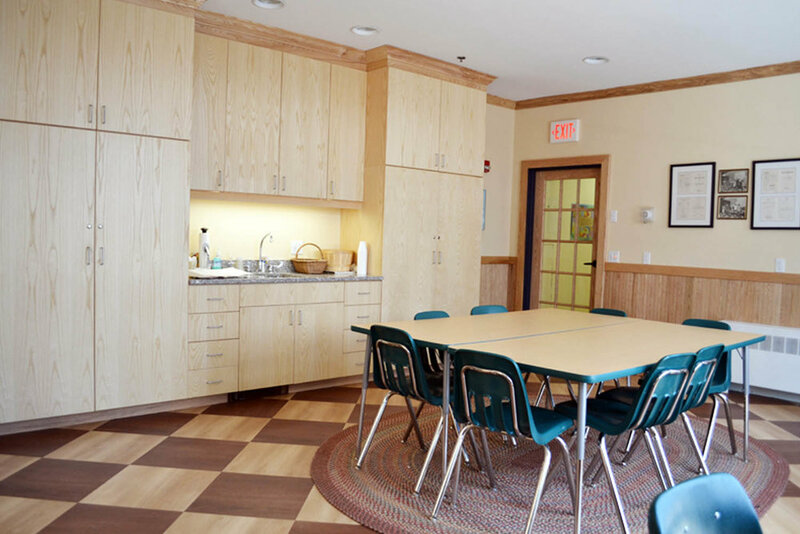 The multi-purpose "Aunt Hibou" room (named in honor of Elizabeth Madeira) is great for small group meetings.